It was probably 15 years ago that I first saw an embroidery machine and went “oooh!! I want that! !” It seemed like the perfect way to add some detail to the historical costumes I made, and my mind was spinning with possibilities. Every year or two I’d stop into a sewing store and look longingly at the newest models, but it was many years before I actually made the purchase. When I finally did get the courage to buy one, it wasn’t the dazzling experience I thought it would be. It started off well enough. I got such a thrill opening the box and looking at all the designs included with the machine. I happily bought thread and stitched a few things out. So cool! Then I needed a real project to test it out on, and that’s where my excitement started to wane. There was a lily among the designs I owned. That seems like something with potential, right? Didn’t Worth make some gowns embroidered with lilies? Surely I could figure out how to add some embroidery to a ball gown. The problem was that one lone lily wasn’t big enough or varied enough to recreate the opulence of a Worth gown without just looking silly. When I went looking for additional lilies, they were too small or the style didn’t blend or they had some other problem, and my grand ideas of ball gowns went on hold. So I looked for a less ambitious project, like some sweet borders for Victorian frillies or a blouse. That worked pretty well, as long as I was willing to limit myself to straight lines. Unfortunately, I discovered there were a lot of curved hems and corners on collars that I had no idea how to work around. So I still wasn’t producing the garments I envisioned, and I was discouraged enough that there were months (and years) where my machine sat gathering dust. The other limitation was that there are very few historically accurate designs out there. My favorites are from Martha Pullen’s historic collection. 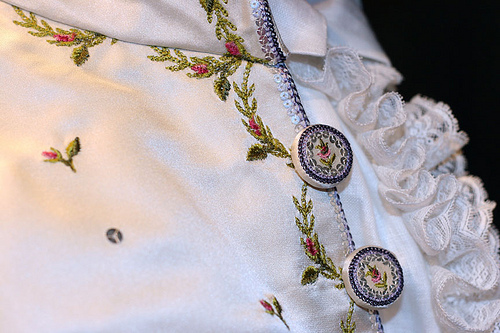 These have the benefit of being taken straight from period clothing, but often aren’t the complete set of designs needed to recreate the garment in question. For example, her DAR collection has designs taken from several waistcoats, but generally only includes the borders. What do you do when you need pockets and collars and all the shaped embroidery? Even with the addition of some pretty expensive embroidery software, the options didn’t expand much. Editing files was hard, and digitizing from scratch was even harder. The first time I managed to cut and paste and smoosh together some designs to create a waistcoat I was over the moon!! It’s still one of my favorite pieces. Unfortunately, there were quite a few flaws in my editing technique that made it unwieldy to stitch out, and I never quite mustered the energy to start over and do it more thoughtfully. A close up of my first really ambitious embroidery project, an 18th c. men’s waistcoat, using heavily edited versions of Martha Pullen’s DAR design collection. Along the way I learned a few things. First, there is a rhyme and reason to how designs are professionally digitized. Even when they are driving us crazy with 14 seemingly needless color changes, they really do know best. There’s a push and pull to the way a machine stitches out, and professional designs compensate for this so that the design is properly aligned at the end of your hard work. My attempts at editing and digitizing taught me exactly how much I didn’t know. Second, modern machine embroidery assumes the wearer is going to toss the clothing in the washing machine frequently. As a result, there aren’t many long floating stitches like you would see in hand embroidery, and the end product often looks flat and modern. Eventually this led me to where I am now, tackling the task of translating historic designs taken from extant garments and period publications into a format that can go into an embroidery machine and come back out looking as handmade as possible. I’ve been working with professional digitizers so the resulting designs are high quality, but it does take a bit of back and forth as I explain WHY I want them to go against the conventions of the industry. Once again, I am getting a good look at how much I don’t know! Along with getting the stitches to mimic hand work, I’ve spent a lot of time playing with different threads. When I first started out, I had no idea there was a world beyond the sea of rayon in every sewing shop. It turns out there is silk, cotton, and wool available, and they add beauty and dimension to a machine stitched design, helping bridge the gap between hand and machine work even more. They can be more expensive, but I think they are worth every penny. Now, someone is going to ask the question – why bother with a machine at all? Why not just learn to do it by hand? Well, I do know how to do the basics by hand, but I currently have neither the skill or the time to create the type of projects I envision. The machine is faster and better than I am, or probably ever will be. As well, some people have physical limitations that would prevent them from tackling an ambitious hand embroidery project. Just like with everything in the costuming world, everyone works at their own level. Some will do handwork, some will do machine work, and some will find trims and fabrics that are close enough for their own tastes. For those that are inspired by the possibilities of machine embroidery, I want to start offering some real alternatives to what is currently out there. My products won’t be for everyone, and that’s fine by me. If even a few people dust off their machines and get excited about embroidery again, it will be worth it.